The Renault Alpine A110-50 looks great on paper but will it rekindle the original success and passion of the A110? In the meantime the Renault-Caterham duo thinks so. It’s hard to evoke the rallies of the 70s without talking about the highlights then. The Lancia Stratos and the Delta, the Porsche 911, and the Renault Turbo 2 without forgetting the amazing Alpine A110. I was 7 years old when my friend’s older brother drove it in our school parking lot. This scarab from another world roared, screeched to a stop as we stood over the wall watching this blue alien squat below. 40 years later, I still have the same desire to own one, albeit, I would probably swap its innards for an electric drive. Purists, scream all you want, this car was made for an electric motor! Alpine Takes On The World Of Rally. Almost 50 years later, Renault wants to rekindle the passion. It’s hard to imagine what the Alpine Renault A110 did in the world of rallying. This impressive car was the brainchild on Jean Redele but was penned by Giovanni Michelotti, whom according to the grapevine never got paid for his design work. It rested on a central welded hollow two Y segment chassis, using at first a modest Renault engine placed behind the real axle. It was eventually graced by the hand of the Gordini sorcerer. The car was produced from 1961 to 1977 with a 1.1 L R8 Major Gordini engine delivering 95 hp at 6,500 rpm. Eventually it received the aluminum stock block Renault 16 TS engine, the same ones Lotus used, with its two Weber 45 carburetors, which delivered 125 hp at 6,000 rpm. This 1600S reached an impressive top speed of 210 km/h, 130 mph. Oh, and did I mention all of this rested on 1,556 Lbs? Alpine Wakes Up Again. So what does Renault aim to achieve with rekindling such an iconic car? Will it be yet another Beetle or Mini with more flavors than the average Joe can choose from or will it keep its original awe? 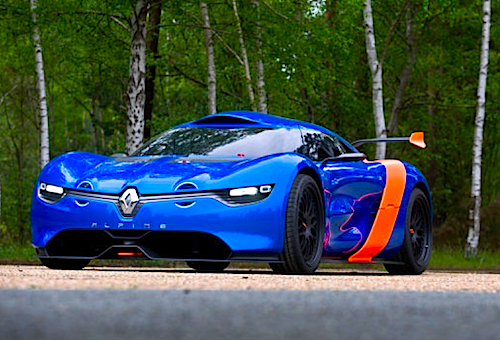 The Renault and Caterham Group’s new joint venture certainly seems enticing enough. Both companies have Formula 1 partnership experience, and each seems to be looking at a different distribution angle. In short, it seems Caterham would distribute it as a small series, while Renault would produce more. Technically Speaking. The new A110-50 is built pretty much as a race car. It does use the same chassis as its Megane Trophy sibling and will use the same adjustable dampers from Sachs mated to 21-inch wheels. But the car will make no use of ABS or other “wuss” traction control modernities. The front brakes should prove big enough to match the performance, 14“ discs pressed by six-piston calipers, and 13” discs in the back with four-piston calipers. Its carbon composite bodywork is coupled to a 3.5L V6 mid-rear engine will deliver 400 hp to the wheels, enough to make this lightweight racer efficiently pump your very own adrenaline. In order to get air to the rear bay, roof mounted funnels will deliver oxygen to the engine, which will use a dual-clutch six-speed gearbox. The Alpine will give you the choice of changing gears via a floor-mounted clutch pedal or through steering paddles. Sacre Blue, it is beautiful! Will we ever see an electric version of the A110-50? It’s not as preposterous as it sounds. After all, if Mercedes-Daimler can come out with an electric SLS, what’s keeping Renault from slapping on its electric drive in it? But this is a complete modern supercar with hints and highlights of a yesteryear gone by. While the design is slightly reminiscent of the original Alpine A110, this A110-50 is a complete make over. This Renault-Caterham A110-50 should provide a few with exclusive bragging rights and a unique looking street racer.